Charles M. Vest speaking at MIT’s Commencement. Former MIT president Charles M. Vest — a tireless advocate for research and science, and a passionate supporter of diversity and openness — died of pancreatic cancer at his home in the Washington area on Dec. 12. He was 72. MIT’s Ludwig Center for Molecular Oncology, housed within the Koch Institute for Integrative Cancer Research, has received a gift of $90 million from Ludwig Cancer Research to study metastasis, the spread of cancer from a primary tumor to other parts of the body. 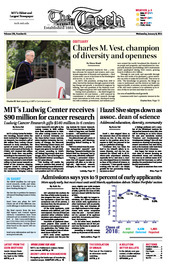 In FY2013, MIT received $58 million research funds from non-profits, according to the treasurer’s report. Hazel L. Sive stepped down as the associate dean of the School of Science on Dec. 16. Sive, who has served in the position since its inception in 2007, has returned to her post as a professor of biology. MIT admitted 612 students for the Class of 2018 under its early action program this year. This number represents a record low early acceptance rate of 9.0 percent, a decrease from the 9.9 percent admittance rate last year.